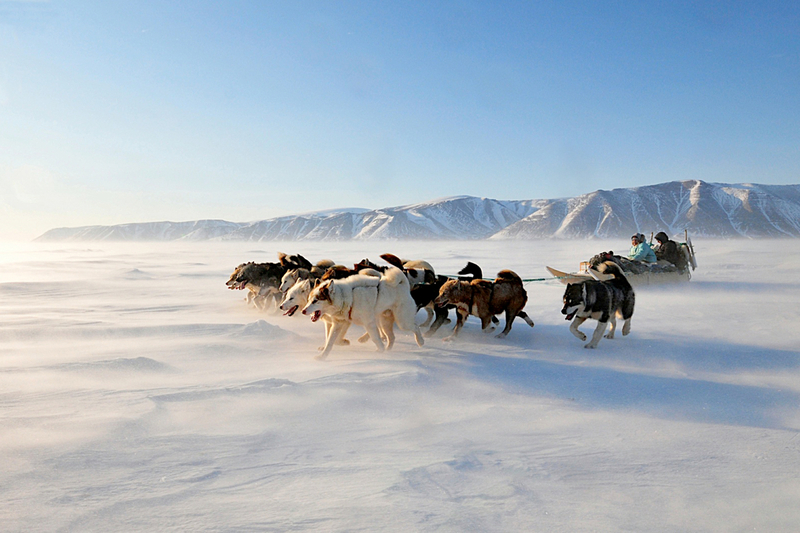 Qaanaaq - dogsledding with Greenlandic hunters. 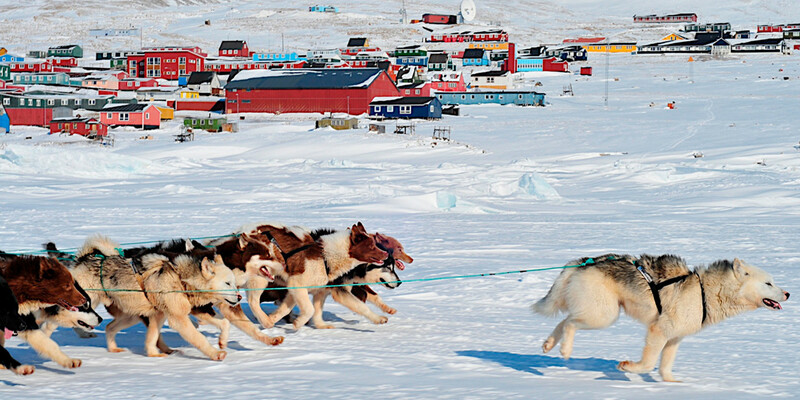 11 days in the far north - 6 days dog sledge tour in the legendary Thule district – Qaanaaq. 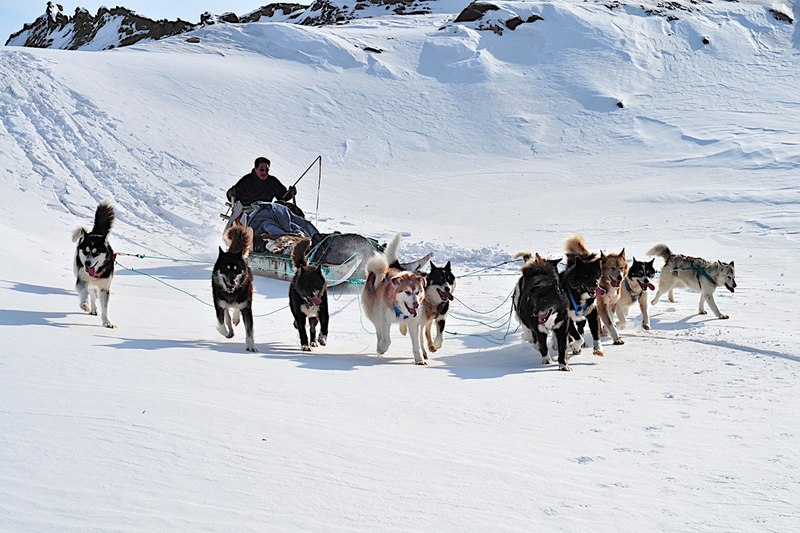 A real taste of the life of the Inuit hunters and the essential means of transportation – the dog sledge. 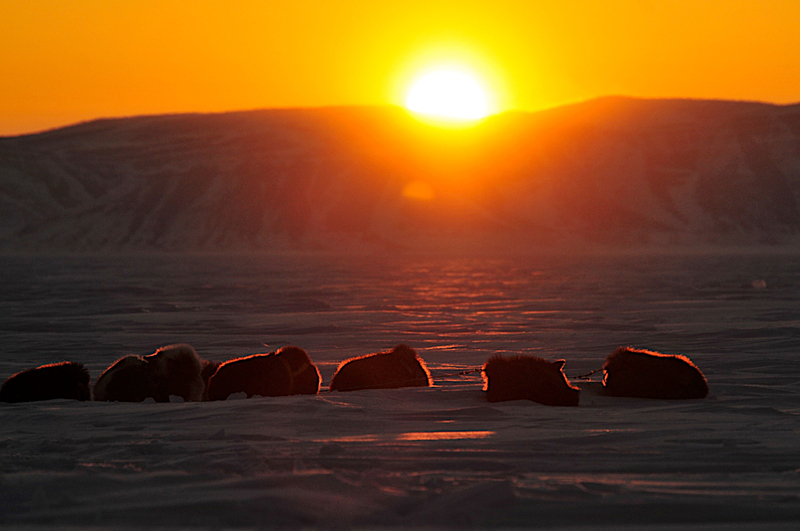 The midnight sun rising from Neqé, “the place with the flooded meat pots”, which the zoologist Christian Vibe in the late thirties used as a basis for numerous expeditions. We fly from Copenhagen to Ilulissat via Kangerlussuaq and can from the air see Kangia - Ilulissat Isfjord with its giant icebergs in the fjord. We are staying at Hotel Icefiord. Today, the trip continues north to Qaanaaq in the north. On arrival we will start preparations for tomorrow's start of the sled. Day 3. 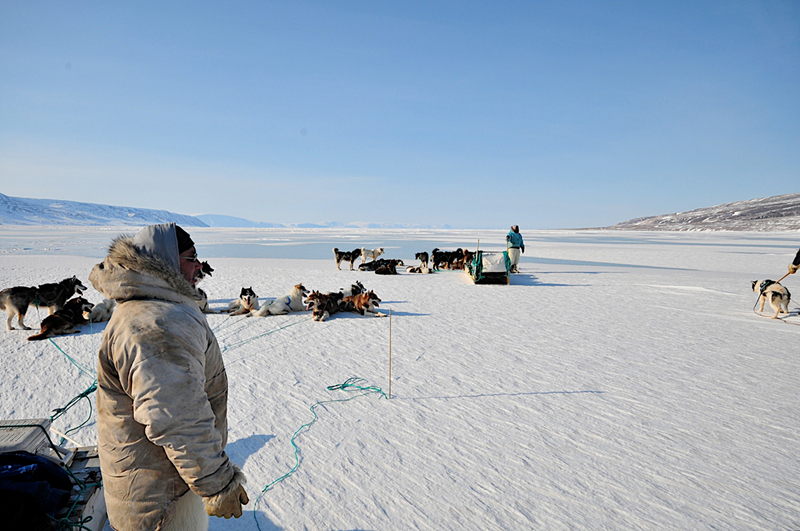 "Pingapok" - Dog sledding starts! We pack the sleds, the start signal sounds to the dogs, and the big sledges start - and so does our adventure for the next 6 days. 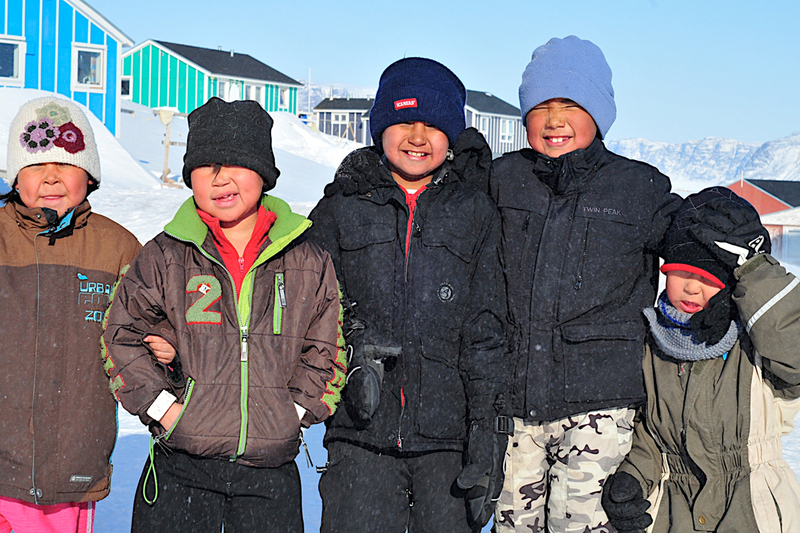 We are driving today in the Siorapaluk area, where sledges at the houses, kayaks on wooden stands, kayaks for search catches and spotted seal / and polar bear skins testify of the village's absolute headquarters. Day 5. Neqé - "the place with the stuffed pots"
The place has been a good fishing place since ancient times, and the fjord is a gathering place for walrus, narwhal, white whale and remmed seal. We let the sled and the situation determine the day's program. At this time of year the prisoners take the kayak on the sledge and drive out to the ice edge to hunt narwhal - maybe we'll see it. 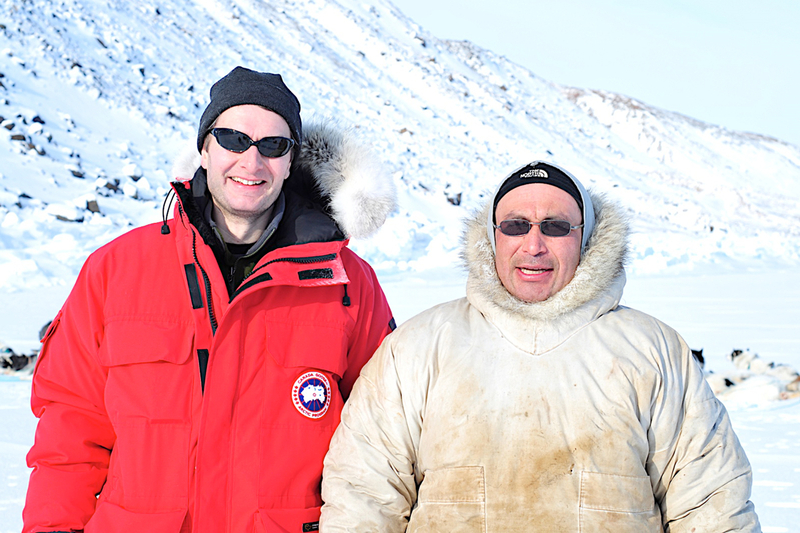 We are heading for Qaanaaq, where we will be back tomorrow. 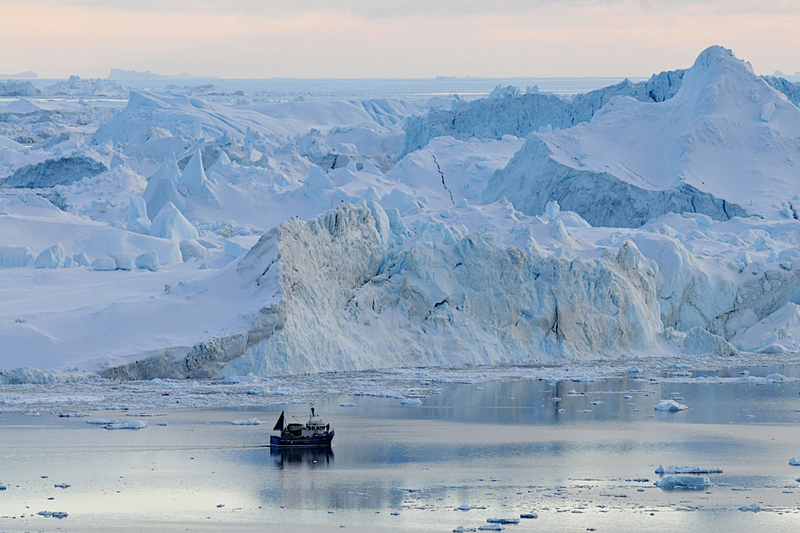 Today we see the impressive brooks in the bottom of the fjords and of course fjordsets / web pages resting on the ice. 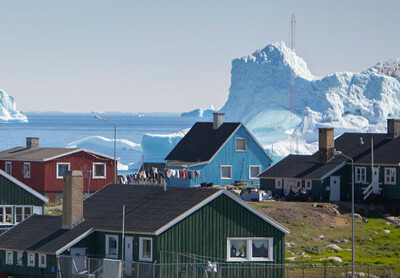 We return to the civilization in Ilulissat and may walk out to the old settlement Sermermiut and the Kællingeklift and watch the big icebergs in close range. It´s up to you whether you decide for a trip around the city with a visit to Knud Rasmussen's birth and childhood home, go on ice-fjords or maybe even a helicopter trip? 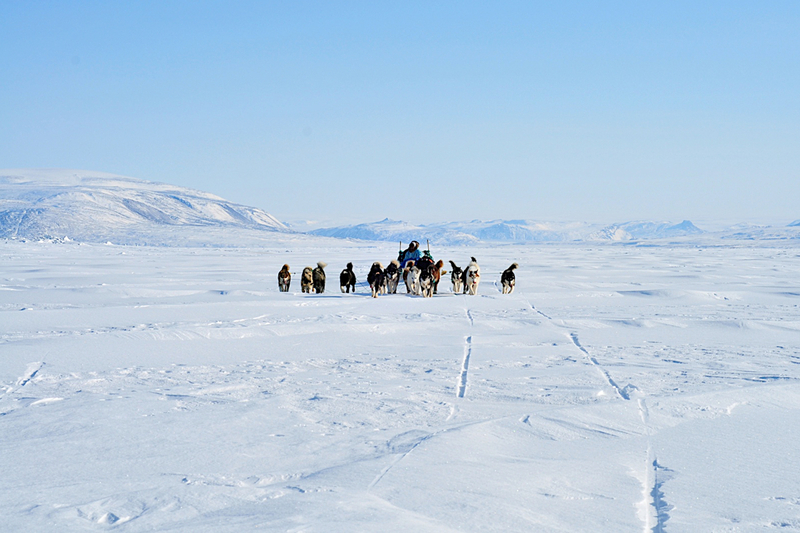 The great adventure on dog sledding in North Greenland is now over and we are returning to Denmark. 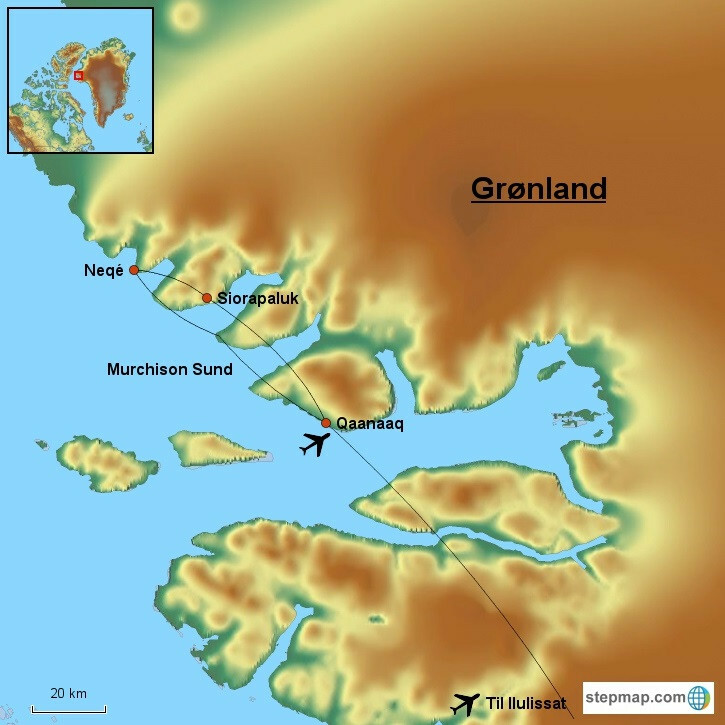 We fly from Copenhagen to Ilulissat via Kangerlussuaq. Just prior to our landing in Ilulissat we pass Kangia also known as Ilulissat Icefiord with its gigantic icebergs in the mouth of the fiord. Here the icebergs ground on the submerged moraine – at approximately 350 metres of depth! 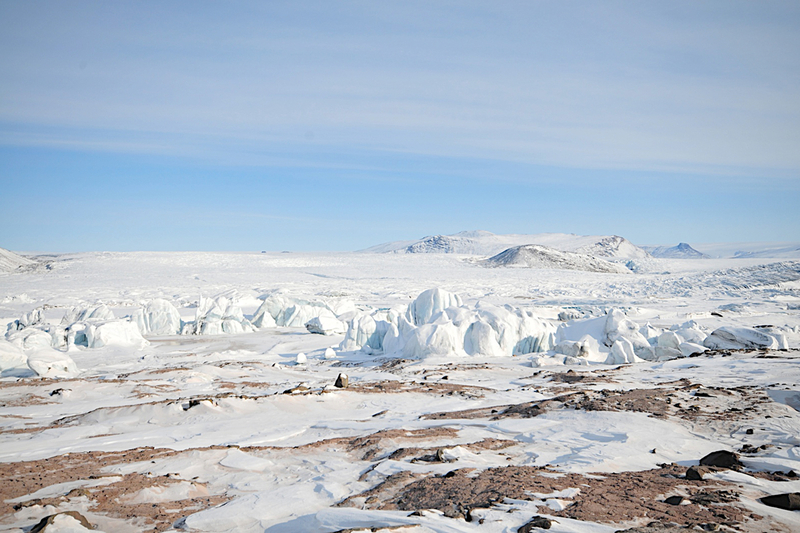 No wonder that the icefiord received the privilege of becoming an UNESCO World Heritage Site in 2004. A representative from the hotel will meet you in the airport and make sure that you are checked in at the hotel, which is situated with a beautiful view of the Disko Bay. We will enjoy dinner at the Hotel Arctic. 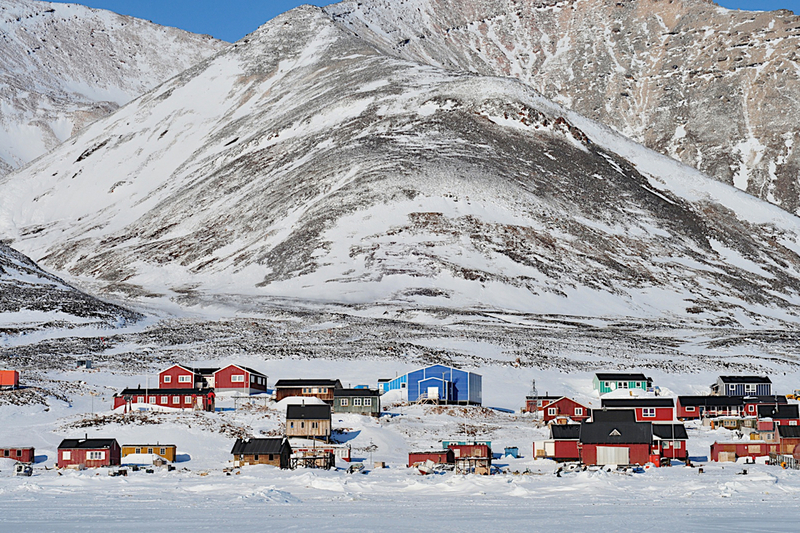 Today the tour takes us further north towards Qaanaaq via Upernavik by plane. If the visibility is good during the flight we will have a fantastic view of the Melville Bay and the enormous ice fields – territory of the great polar bear. It is fascinating to think about the fact that the great Arctic explorers Knud Rasmussen, Ludvig Mylius-Erichsen, Moltke and Jørgen Brønlund drove all the way from Ilulissat to Qaanaaq on dog sledges during the literary expedition in 1902-04. 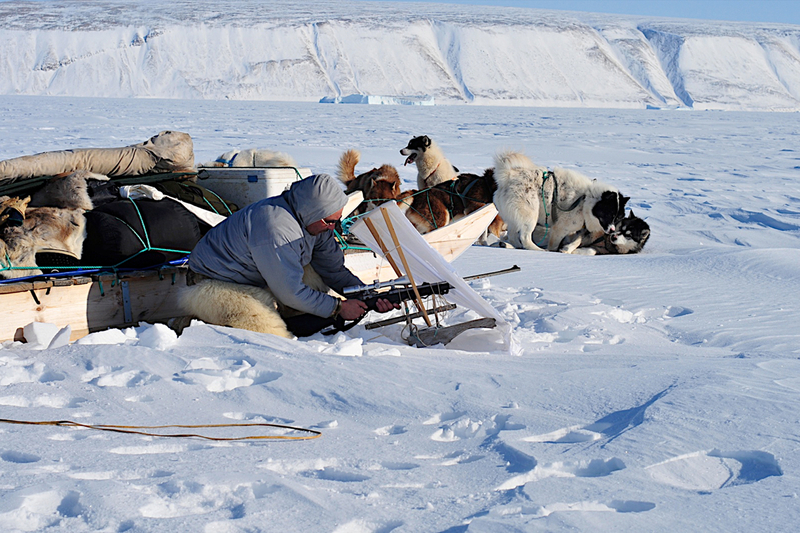 Immediately after check in at the hotel in Qaanaaq we will start preparing tomorrow’s dog sledge tour. Day 3. 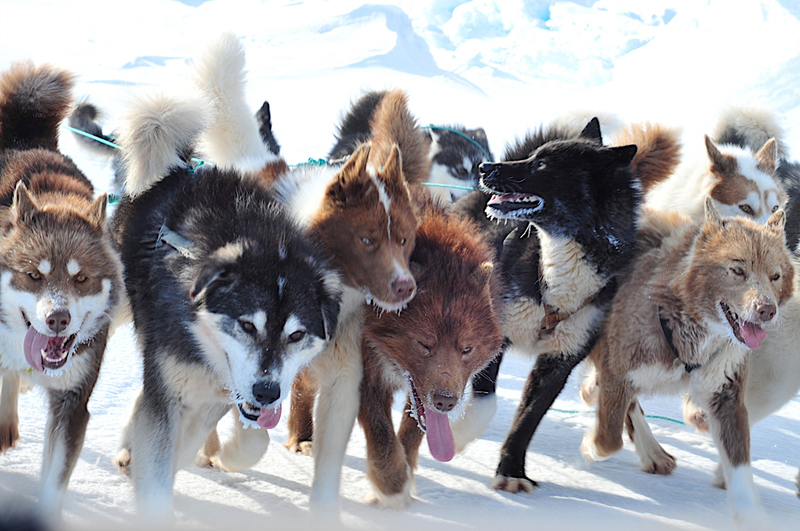 "Pingapok" - "It's great" – Our dog sledge adventure begins! Immediately after a solid breakfast we will do the last grocery shopping and get our luggage and supplies shipped to our waiting sledges. Notice how the sledges are loaded very thoroughly! The sledge box with primus stoves and petrol, pots, etc. 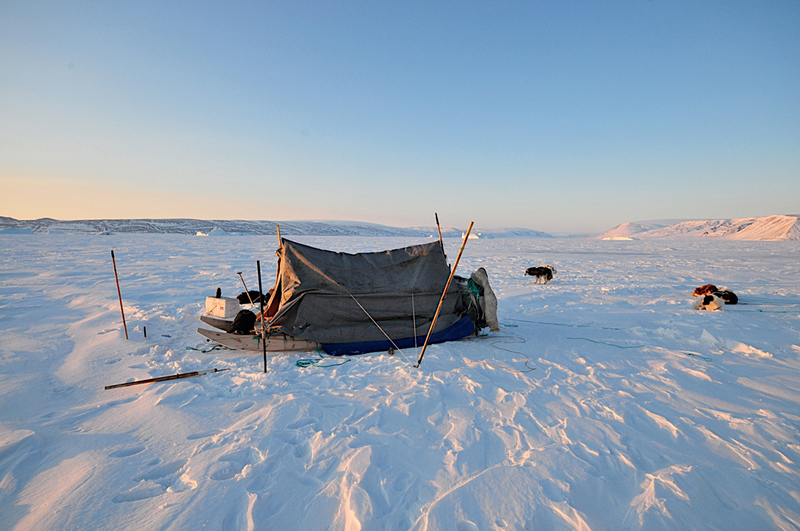 in the back of the sledge, the harpoon and the utoq along the sides, reindeer skin on top of the load and finally the rifles, which are placed between the lashings making them easily accessible – after all we are in bear land. 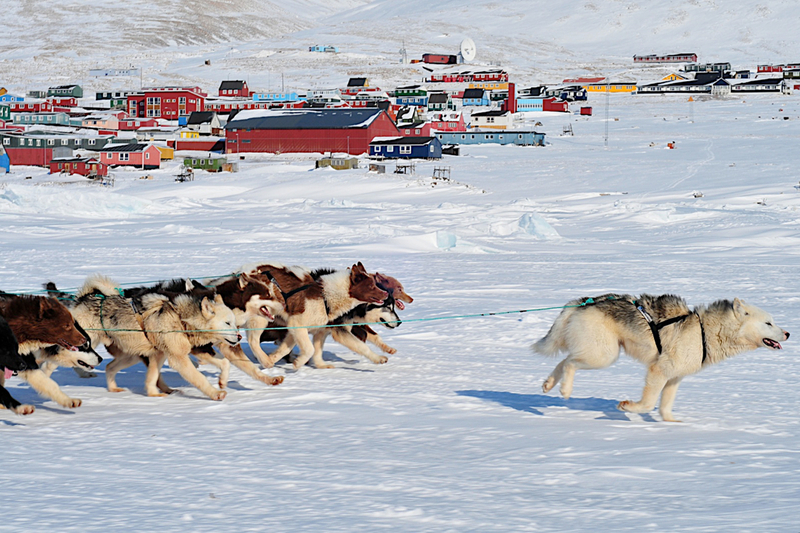 The starting signal is given to the dogs and the sledges set off with a heavy tug – the tour has started! We will be driving on the Robertson Fjord and in the distance we are now able to see Siorapaluk at the base of the mountain. In all of Greenland Siorapaluk is the best area to see little auks but the season for them is not until the month of May. The researchers believe that 20 to 40 million little auks breed here. Blubber preserved little auks – "Kiviaq" is still a popular delicacy in this area. Sledges near the houses, kayaks kept in wooden frames, racquets for catching little auks and stretched seal and polar bear skin hung out to dry - all of this a proof of the main profession in the settlement. 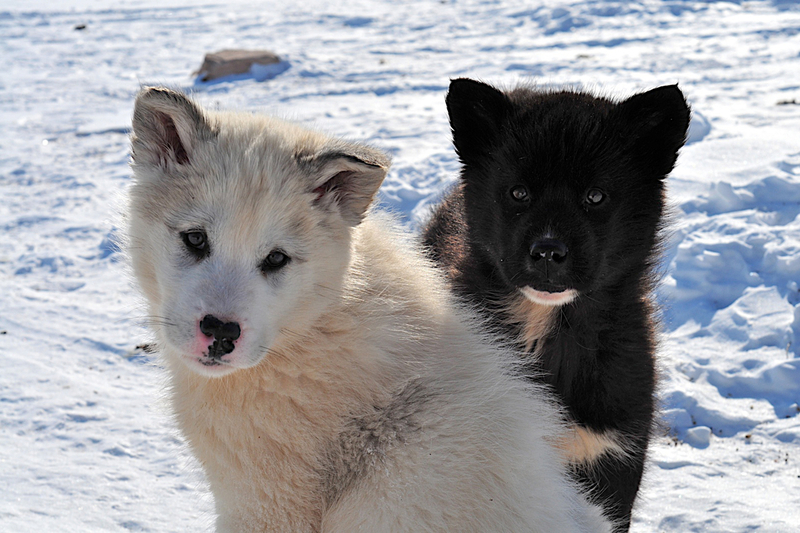 The fur of the puppies here is yellow and stiff from all the blubber they like to roll in and gorge themselves on. “Since the older times this place has been an excellent hunting ground. Widespread submerged walrus banks lie close by where walruses can be seen all year round. Narwhal and beluga migrate during the summer in and out of the fjord, the bearded seal feeds on the Arctic cod that lives at the bottom of the fjord. In the winter the seal has its breathing holes somewhere between the banks of icebergs. 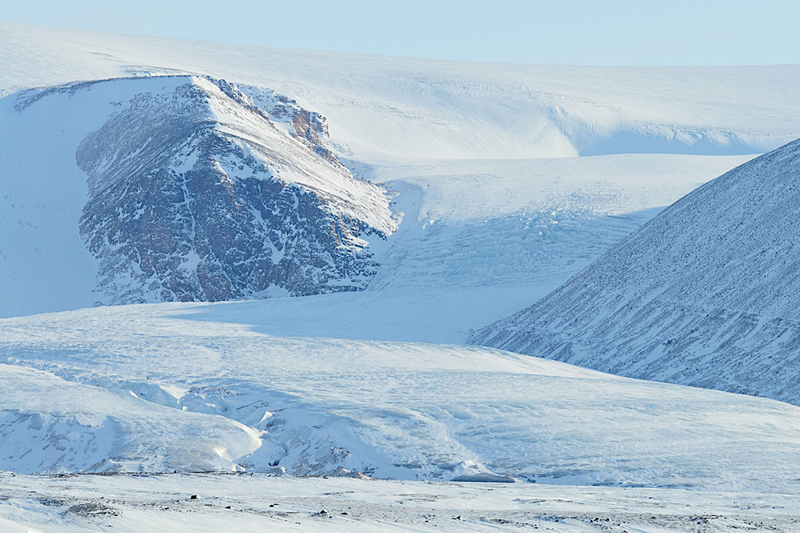 The mountains surrounding Neqé are full of little auks that fill the air with twittering from May to September and the Arctic fox feeds on birds, birds' eggs and young birds. Only a hunter without talent should not be able to obtain meat here”. The above mentioned text is a quotation from the book written by Christian Vibe ”Langthen og Nordpå”, we will let these words stand alone for this day's adventure. We will let the sledding conditions and the ice situation decide the programme for today. 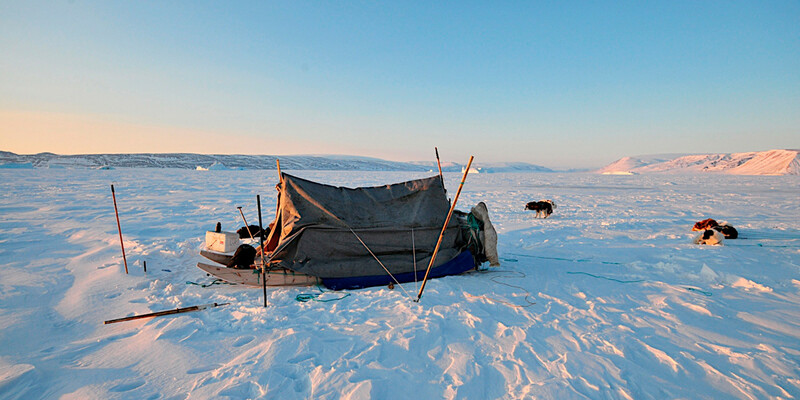 We could choose to use Neqé as a base for a day trip going further north to Kap Powell or alternatively drive to hunting areas near the edge of the ice – if it is possible. 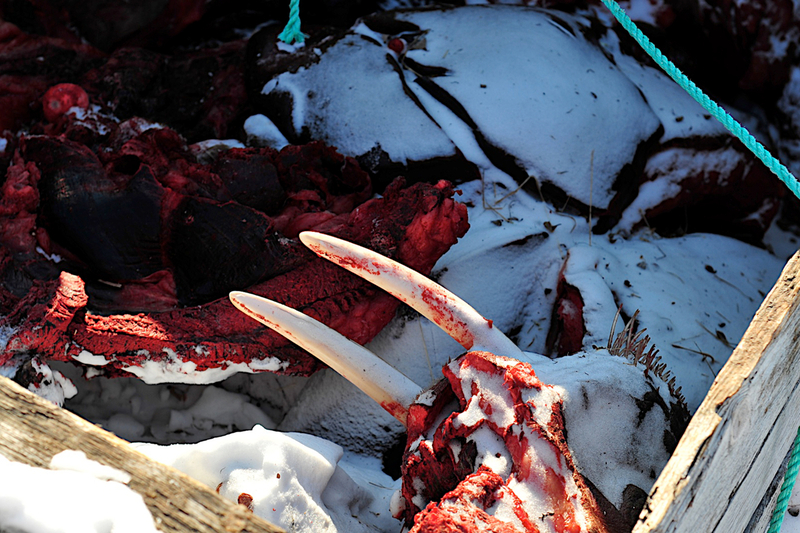 On this time of year the hunters grab their kayaks, strap it on their sledges and drive towards the edge of the ice to hunt for narwhale with harpoon and rifle. We might get a chance to witness this fascinating hunting method. 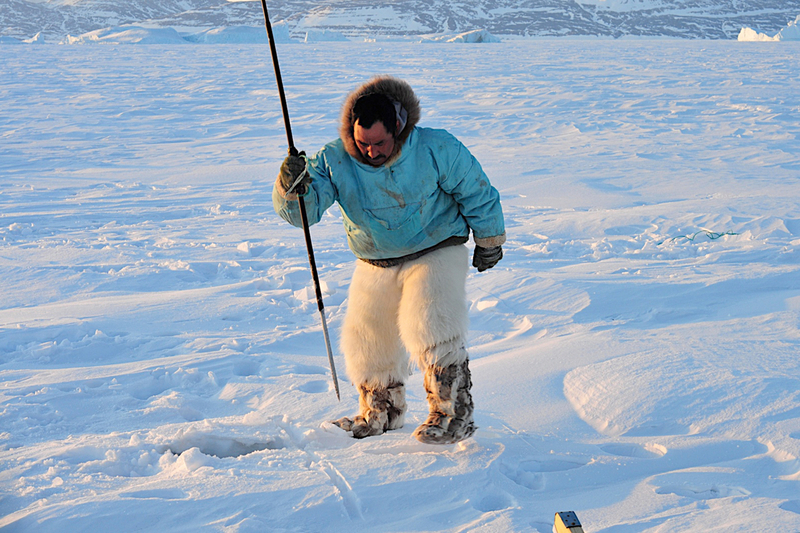 Successful hunters are very willing to share their catch so we might have the opportunity to taste walrus, whale, etc. during the tour. 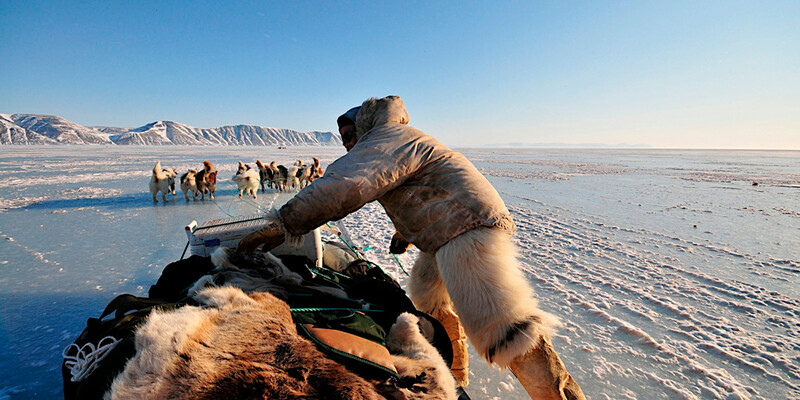 We head in the direction of Qaanaaq which is tomorrow's destination. On the way we probably let us distract by the Robertson and Mac’cormick fiords and the impressive glaciers in the head of the fiords. We will probably also see the ringed seals that rest on the ice near their breathing holes. Seal meat - a lovely delicacy that makes sure that you keep warm with a smile upon your lips. 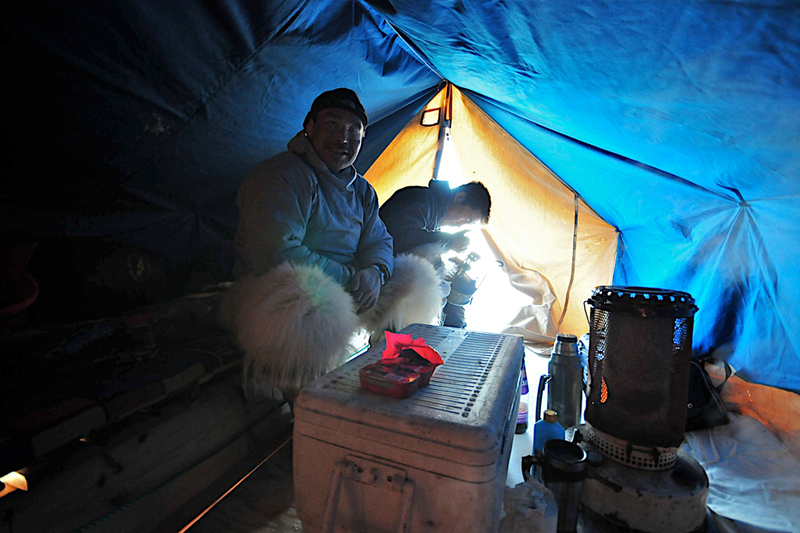 After some eventful days on the sledges we arrive in Qaanaaq some time in the afternoon. We depart with the sledge drivers and head towards the hotel where a well deserved hot shower is to be found. After this there will be time to pay the local museum a visit. The museum houses a very interesting collection of items that are related to the historical Thule trading station, which has also been immortalized in the world famous books written by Knud Rasmussen and Peter Freuchen concerning the so-called “Thule Expeditions”. The cementery which is beautifully situated outside town also tells the story of the past of this place and the great personalities living here. 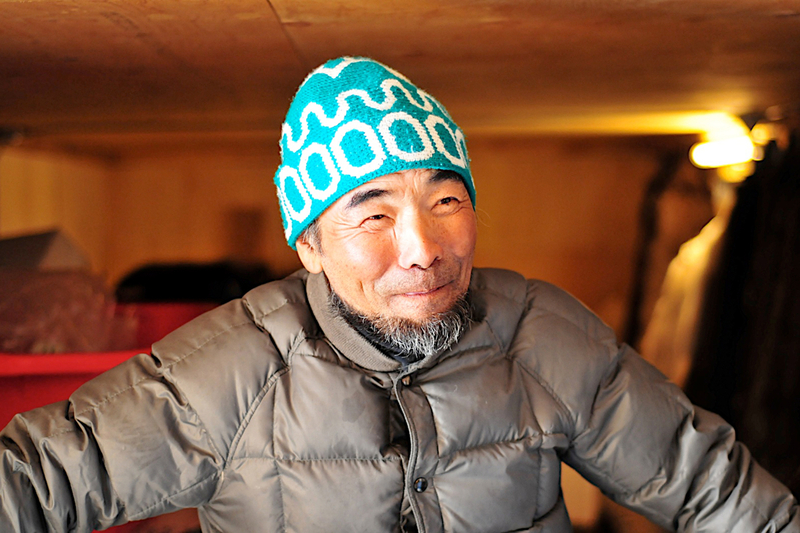 We will have dinner at the hotel where personalities such as Reinhold Messner and other Arctic explorers have recovered after strenuous and exciting expeditions in the area. 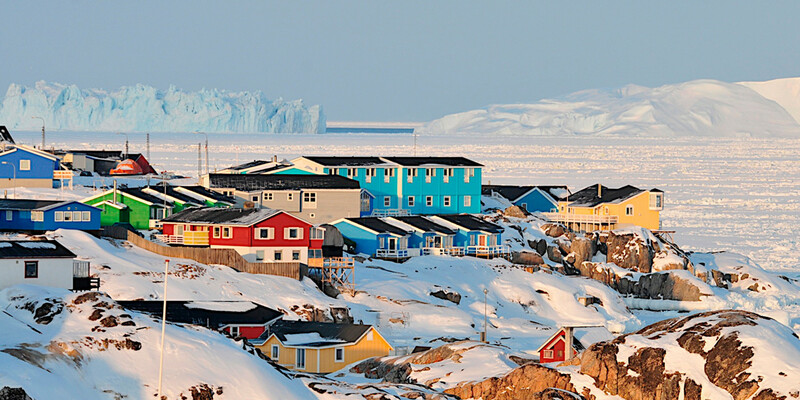 Air Greenland’s Dash 7 brings us back to Ilulissat via Upernavik. After checking in at our hotel in Ilulissat a hike to the old settlement of Sermermiut just outside town can be arranged. From this settlement we will have an impressive view of the ice packed Kangia Icefiord that consists of the biggest icebergs in Greenland. 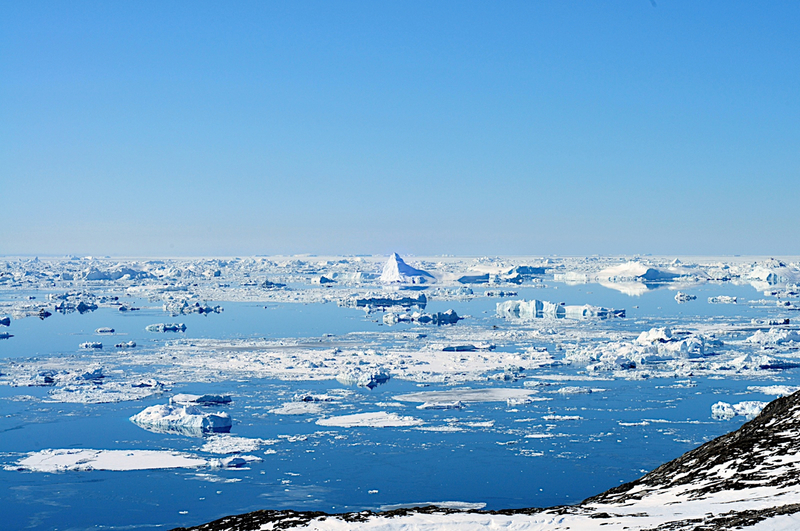 The majestic icebergs constantly twist and turn inside the deep blue fiord. 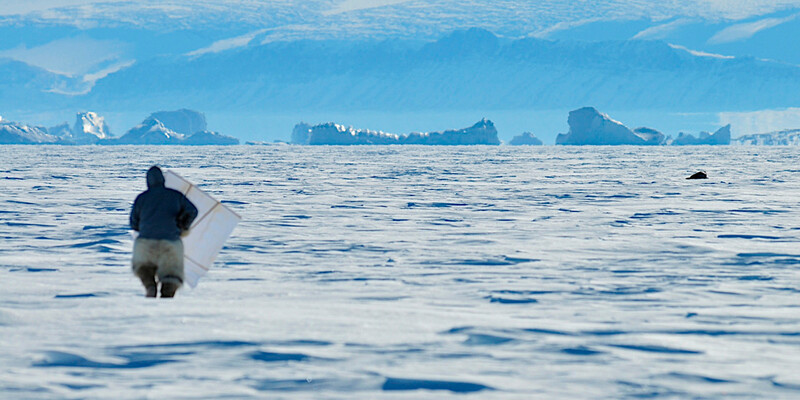 If a piece breaks off the icebergs, the giant roll over scenes are often followed by a banging sound. We have a relaxing day in Ilulissat. It is possible to go down town and visit the birthhome of Knud Rasmussen, which today houses the town museum. Alternatively, you could go on a boat trip to the icefiord or perhaps even a stunning helicopter trip inside the Kangia Icefiord. Countless options are present. Additionally, you cn go shopping for handicrafts, carvings - the famous "tupilak", etc. as a lasting souvenir from Greenland. Time has come to say goodbye to Greenland and jump on the plane to Kangerlussuaq and thereafter back to Copenhagen, Denmark. Personal travelling expenses for souvenirs, maps, drinks and beverages etc. Meals that are not marked under each day (2 x in Ilulissat) – calculate approximately DKK 300-500 totally. Clothes for the sledge trip: jacket, trousers, gloves and boots (sealskin and/or thermo clothes) + sleeping bag and mattres. Maybe you can rent some of this equipment in Qaanaaq or Ilulissat - please contact Topas. Entrance fees to museums etc. 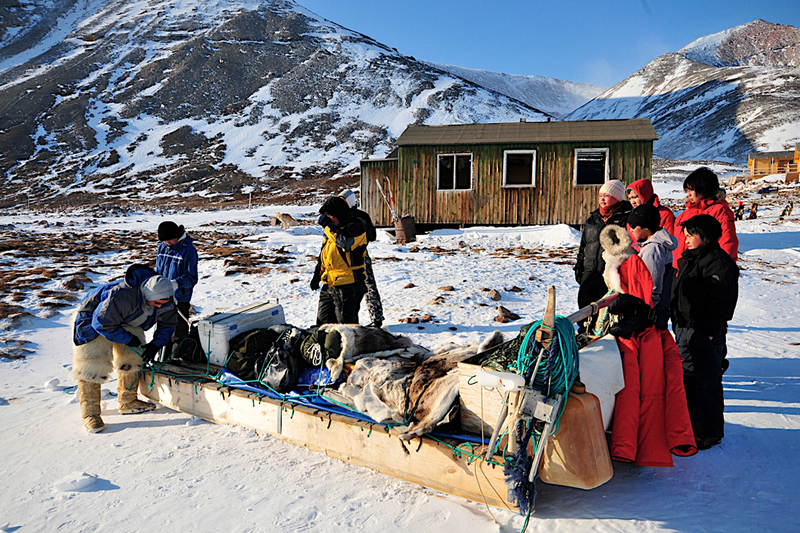 During the sledge trip you can expect meals that are based on Greenlandic products, such as seal meat, fish etc. In addition to this there will be served rice, pasta or potatoes. 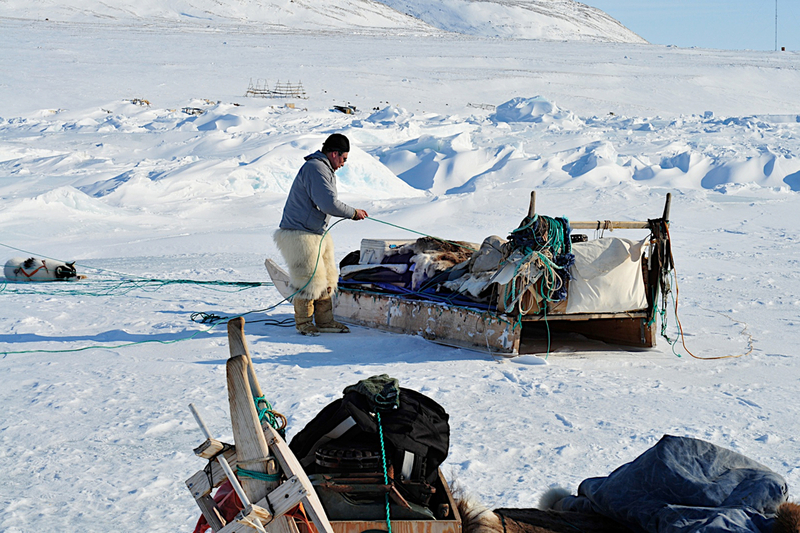 Grocery shopping will be done together in Qaanaaq before the tour starts. This way the participants can have a little word on what will be bought. 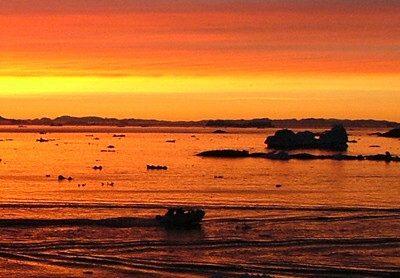 In Ilulissat and in Qaanaaq you will stay overnight in hotels, 3 and 2 nights respectively. 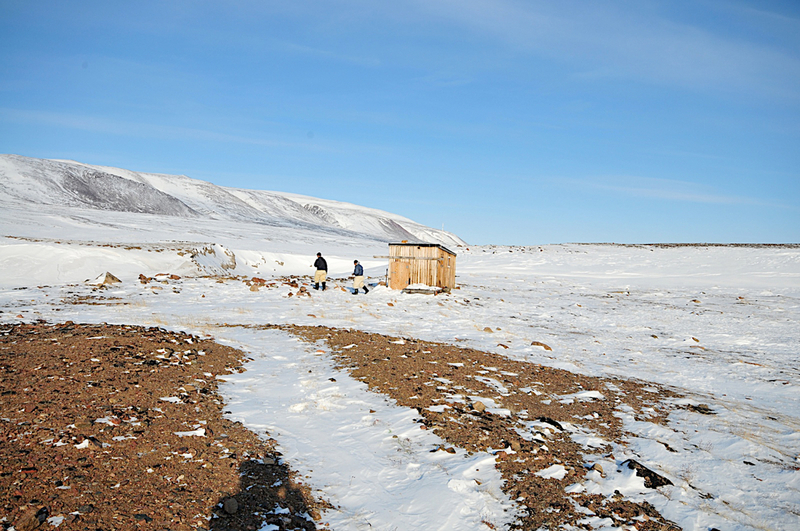 During the sledge tour you will stay in tents, in sledge tents and in hunters' huts. The huts are not spacious but the atmosphere is very authentic! To keep you safe from accidents and hypothermia and to secure an ideal ride on dog sledge it is important to have these few rules mentioned below in mind. The sledge driver will often run next to the sledge or “hang” over the railing in the rear of the sledge. In most cases the sledge driver will sit in front of the sledge to make it easy for him to get on and off. Thus the passengers sit in the rear end of the sledge. Passengers are faced in the driving direction. 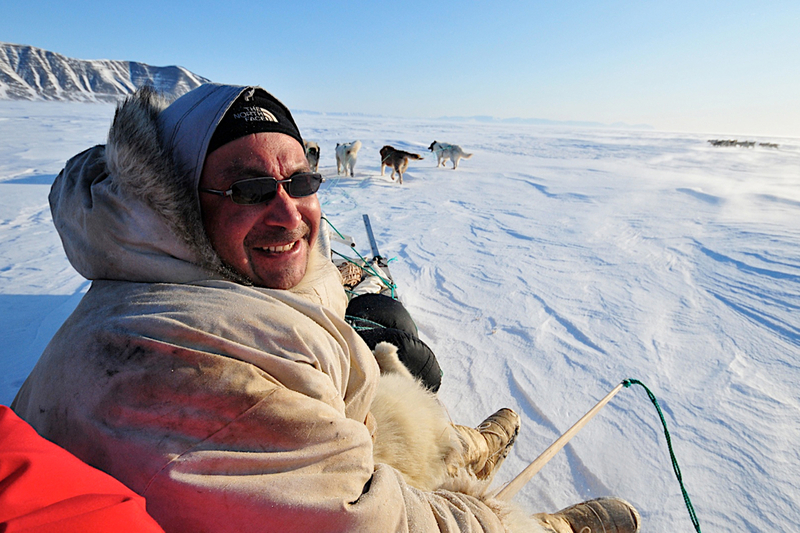 If you pass flat terrain you can shift position and sit across the sledge. 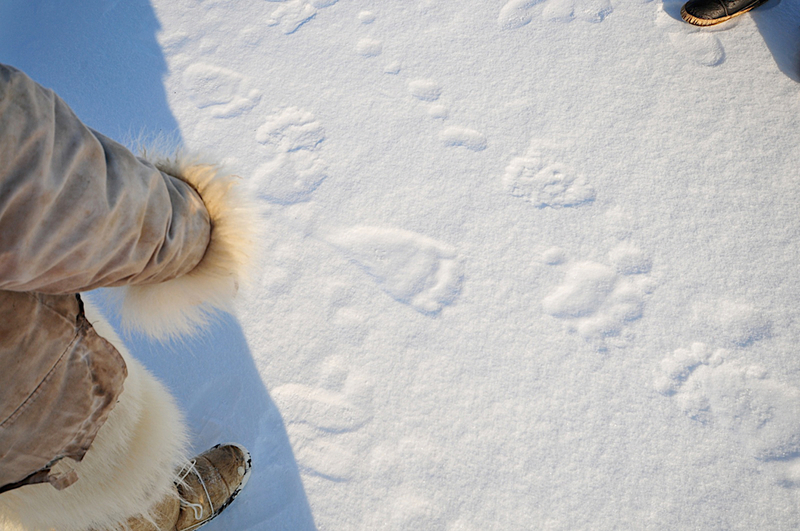 Place your legs on the sledge to prevent your feet from hitting rocks and ice. In rough terrain or up hill, hold on to the wire/ropes on the sledge. NEVER hold on to the side of the sledge as this can cause injuries to your fingers if they are caught under the sledge. In rough terrain you can help the sledge driver with the balance by leaning to the opposite side of where it heels to. When driving on ice you will now and then pass cravasses in the ice. 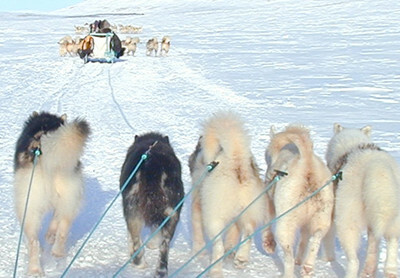 It is important to stay on the sledge (unless the driver gives other specific information) as it is usually easier to pass these cravasses sitting on the sledge. During steep ascents it may be necessary to step of the sledge and walk next to it until the ascent is over. If it is cold you should every now and then step off the sledge to run/walk next to it. Never approach the dogs without permission from the driver. Never give leftovers from lunchboxes to the dogs. Always use sunglasses and remember sun lotion with high factor. The sun lotion should not be water based due to the frost. Camera and video equipment are best kept underneath the clothes to secure the batteries against the cold. 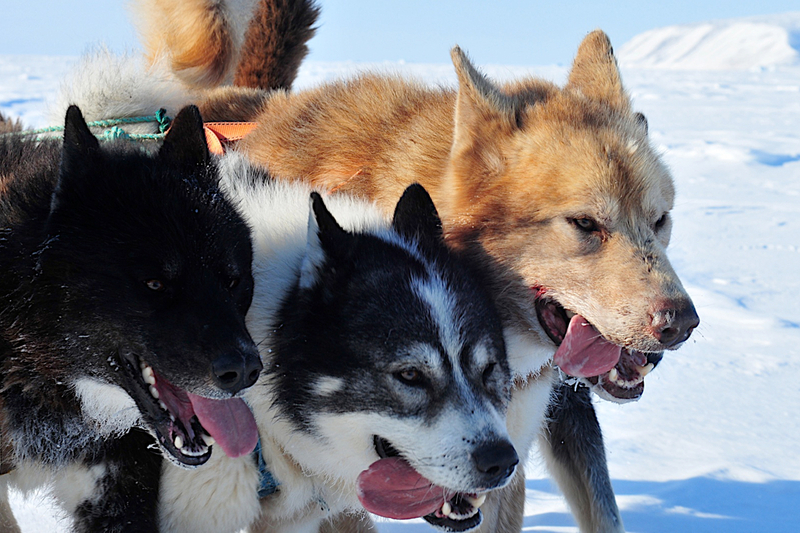 The participants are to consider themselves as active members of a dog sledge expedition. 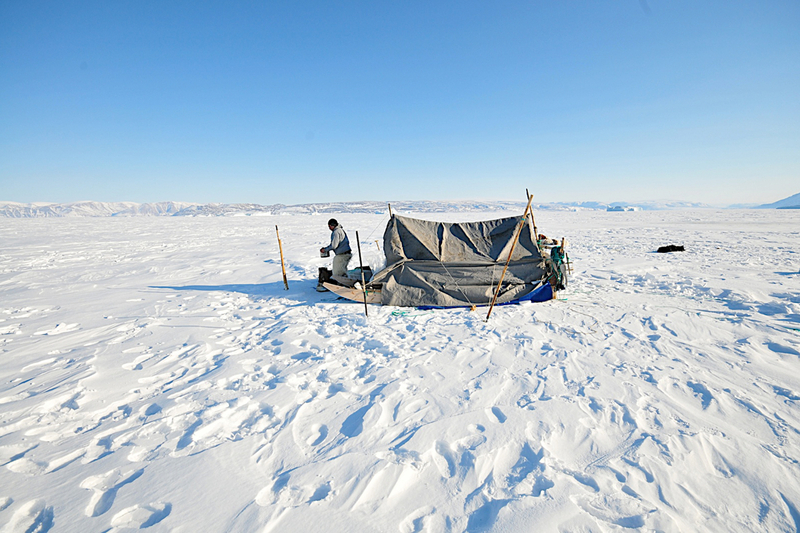 This means that you will have to take part in the necessary tasks of the camp life: putting up and taking down tents, cooking, dish washing, preparation and packing of sledges etc. You can leave parts of your luggage behind in the hotel in Qaanaaq during the sledge trip. A special tour needs a special packinglist. You will find it here. 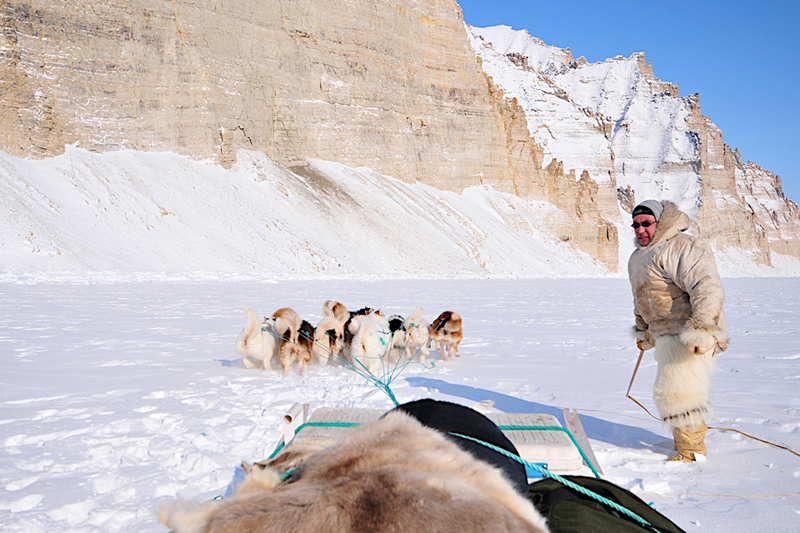 11 days – 6 days on dog sledge tour in Qaanaaq – Thule District (graduation 1-2). 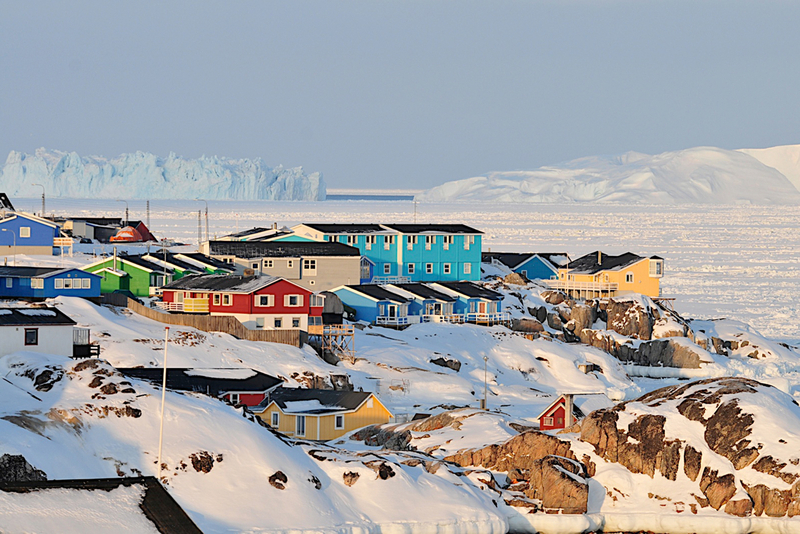 Approximately 2 days in Ilulissat. 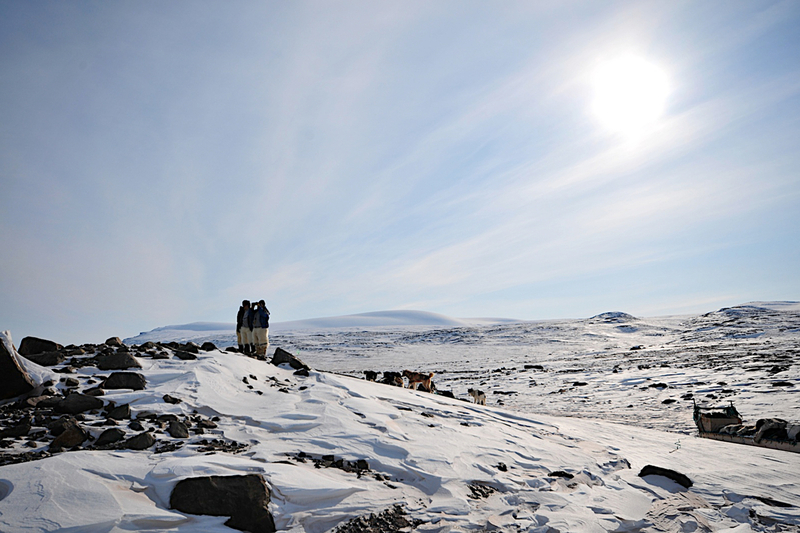 The average temperature in Qaanaaq in May is between -25º C and -15º C. This is the average temperature throughout 24 hours. Nights can be relatively cold, but as soon as the sun rises, so does the temperature. Because the air humidity in the Arctic is very low, it does not feel as cold as in Europe for a given temperature. Night temperatures can get below - 30C. Due to the cold and clear weather this time of year, the visibility is very often excellent. Maps can also be bought locally. Ivars Silis: ”My wide, white world”. 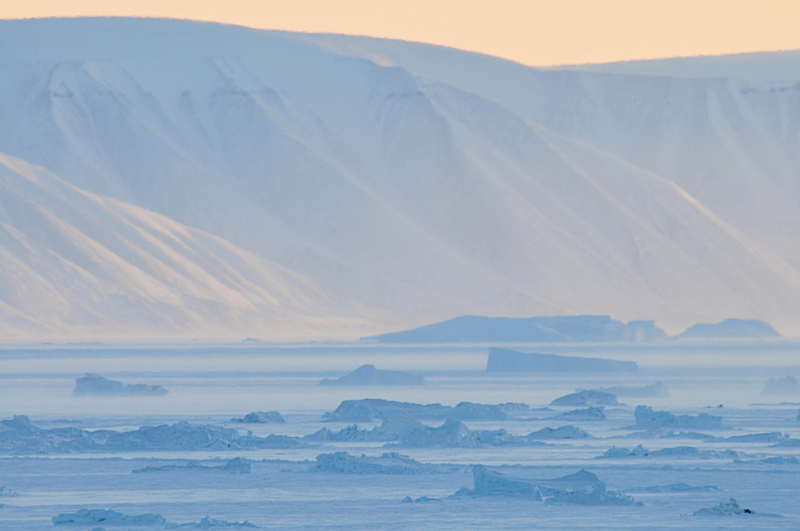 Ivars Silis: ”Frozen horizons – the world's largest national park”. Various very interesting literature is written by earlier ice cap explorers Knud Rasmussen and Peter Freuchen. This sledge tour is the real deal – so to speak. 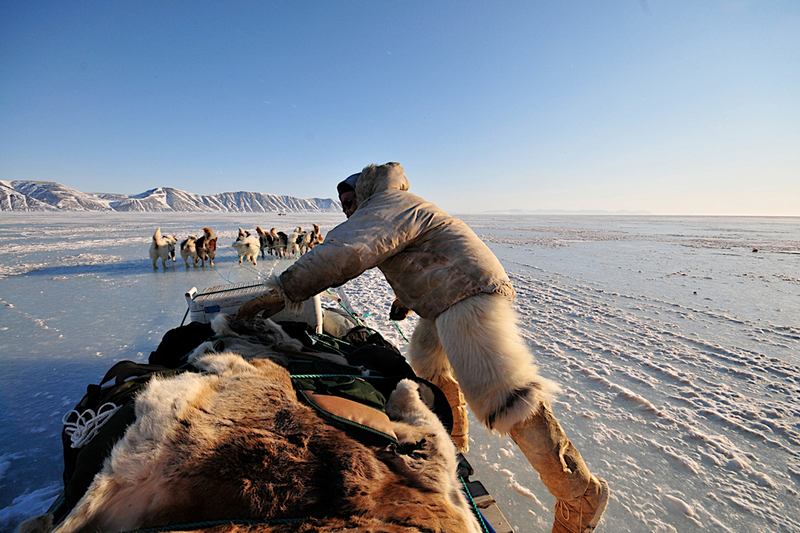 That means that the sledge drivers are Greenlandic full time hunters and their main profession is sledge driving. They know what they are doing based on generations of experience, therefore the participants can feel totally safe under their guidance. The drivers do not speak English – if they do, it is kept at a minimum. But with the use of eye contact, body language and prudence, communication is not a problem. A tourleader will not be present on the tour but in Ilulissat you will get a thorough briefing by one of the guides from World of Greenland. 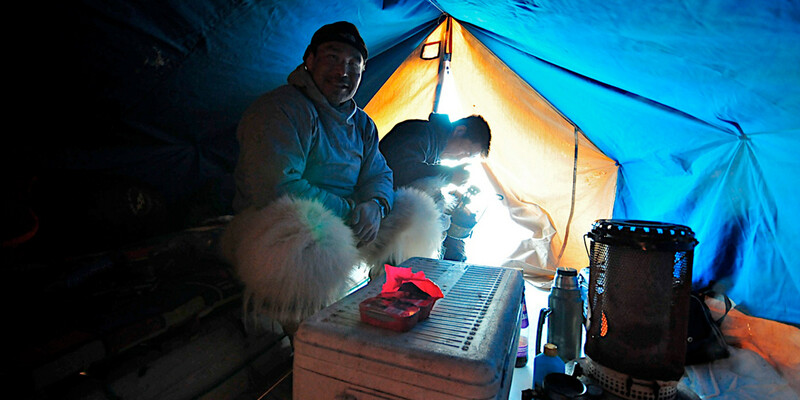 World of Greenland is the local agency that has established this tour cooperating with Topas Adventure Travel. 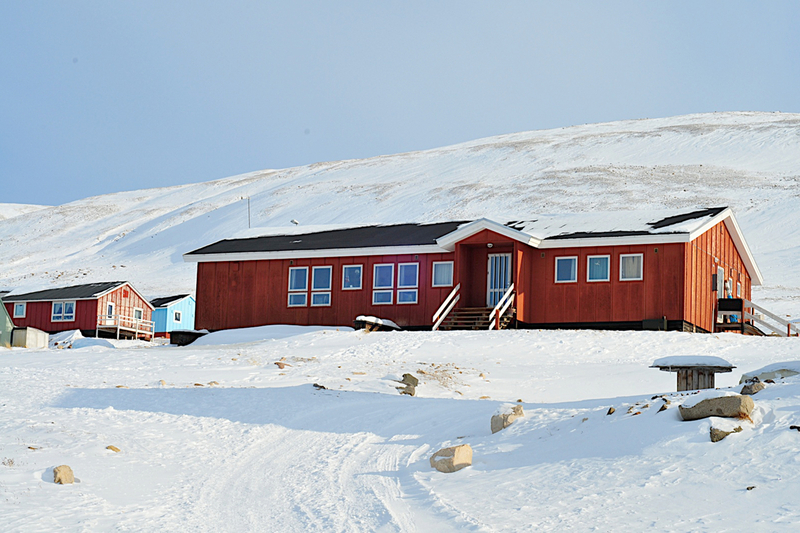 In Qaanaaq an English/Danish-speaking liaison is present at the hotel. On the dog sledge tour the sledge drivers and the participants only communicate as mentioned above. Enough talking - let the adventure begin! We reserve all the rights to change the program. 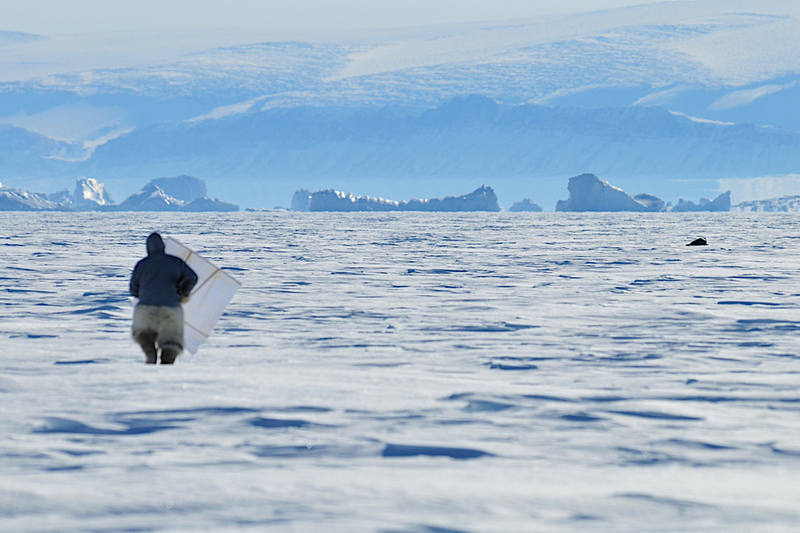 A trip like this is very vulnerable to changes of wind, weather, and ice conditions. There may occur some delays or cancellations of some parts of the program, especially those that concern flight or boat transportation. No compensation will be offered within the first 24 hours of delay or change of program due to circumstances that can not be influenced by Topas. Be aware of the fact that snow- and ice conditions vary each year. The sledge drivers will hopefully be able to follow the route that the program incorporates, but the sledge trail tells whether you will be able to follow the route or not. NOTICE: Increased deposit on plane ticket - contact Greenland by Topas.